S.G. Pepelyayev Article 169 of the Russian Legal Code Should be Removed! "Representative Power – 21st Century: Legislation, Commentary, Problems" is the only magazine published under auspices of the committees of the State Duma, RF Federal Assembly. Its short title is "Representative Power – 21st Century". The magazine is an independent legal scholarly and practical bi-monthly periodical founded in 1994. We also publish special issues. 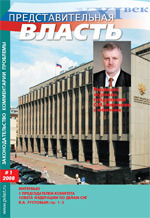 The magazine is dedicated to legal aspects of the activity of the representative branch of government. It contains commentary and review of legislative acts, draft laws, legal expertise, questions of parliamentary ethics, analysis of the practice of implementation of law and other normative acts, problems of legal regulation of judicial system, financial activities, taxation, science and education, globalization, religious organizations and public associations, guarantees of human rights and civil freedoms, development of the civil society, etc. The magazine goals are aimed at development of the rule of law, representative power and parliamentarism, financial market, foreign investments, institutions of the civil society in Russia; protection of human rights and civil freedoms; enhancement of humanitarian values, ethics and morality. Since creation of the magazine, we have published several special issues dedicated to political parties, elections of the deputies and RF President, parliamentarism, various aspects of lobbyist activities. We pay a lot of attention to economic reforms, international relations and various areas of law and legislation.